Metal forging is a deformation process where metal is pressed, pounded or squeezed under great pressure into high strength parts known as metal forgings. The forging process is entirely different from the casting (or foundry) process, as metal used to make forged parts is neither melted nor poured as in the casting process. Forging is defined as a metal working process in which the specific shape of metal work piece is obtained in solid state by compressive forces applied through the use of dies and tools. During the forging process controlled deformation of metal takes place. Forging process is accomplished by hammering or pressing the metal. In modern times, industrial forging is done either with presses or with hammers powered by compressed air, electricity, hydraulics or steam. All the metals and alloys are forgeable, but the forgeability rating of different metals and alloys can vary from high to low or poor. The factors involved are the composition, crystal structure and mechanical properties all considered within a temperature range. The wider the temperature range, the higher the forgeability rating. Most forging is done on heated work pieces. Cold forging can also take place at the room temperatures. Forging process is one of the oldest known metalworking processes with its origin about some thousands of years back. The process goes back to 8000 BCE and evolved from the manual art of simple blacksmithing. Traditionally, forging was performed by a smith using hammer and anvil. Using hammer and anvil is a crude form of forging. The smithy or forge has evolved over centuries. Then as now, a series of compressive hammer blows performs the shaping or forging of the part. Modern forging uses machine driven impact hammers or presses which deform the work piece by controlled pressure. The forging process is superior to casting in that the parts formed have denser microstructures, more defined grain patterns, and less porosity, making such parts much stronger than a casting. Forging refines the grain structure and improves mechanical properties of the metal. With proper design, the grain flow can be oriented in the direction of principal stresses encountered in actual use. Grain flow is the direction of the pattern that the crystals take during plastic deformation. Mechanical properties (such as strength, ductility and toughness) are much better in a forging than in the base metal, which has, crystals randomly oriented. Forging’s directional grain flow ensures high part strength with superior fatigue resistance, mechanical properties, and metallurgical soundness. Forging eliminates internal voids and porosity, and produces unmatched structural integrity. Forging process produces parts of superior mechanical properties with minimum waste of material. The starting material in the process of forging has a relatively simple geometry. This material is plastically deformed in one or more operations into a product of relatively complex configuration. Forging usually requires relatively expensive tooling. Hence, the process is economically attractive when a large number of parts are to be produced and/or when the mechanical properties required in the finished product can be obtained only by a forging process. Forging processes can be classified in the following different ways. Based on temperature of the work piece being forged, the forging process can be (i) hot forging, (ii) warm forging, and (iii) cold forging. In real conditions during industrial manufacturing, friction plays a part in the process. Friction forces at the die-work interface oppose the spreading of the material near the surfaces, while the material in the centre can expand more easily. The result is to create a barrel shape to the part. This effect is called barreling in metal forging terms. Barreling is generally undesirable and can be controlled by the use of effective lubrication. Another consideration, during hot forging manufacture, which usually acts to increase the barreling effect, is the heat transfer between the hot metal and the cooler die. The metal nearer to the die surfaces cool faster than the metal towards the centre of the part. The cooler material is more resistant to deformation and expands less than the hotter material in the centre, also causing a barreling effect. The advantages of hot forging are (i) high strain rates and hence easy flow of the metal, (ii) recrystallization and recovery are possible, and (iii) forces required are less. Disadvantages of hot forging are (i) lubrication at high temperatures is difficult; (ii) oxidation and scaling occur on the work piece, (iii) poor surface finish, (iv) lesser precise tolerances, and (v) possible warping of the material during the cooling process. In the warm forging process, the temperature range during the forging can be from above room temperature to below the recrystallization temperature. In warm forging, the work piece is heated below the recrystallization temperature of the metal (up to 700 deg C to 800 deg C in case of for steel), in order to lower the flow stress and the forging pressures. Parts with radial flow like round configurations with centre flanges, rectangular parts, and non-axisymmetric parts with 3- fold and 6-fold symmetry have been produced by warm extrusion. There are times when warm forging practices are selected over cold forging especially for higher carbon grades of steel or where in-process anneals can be eliminated. Compared with cold forging, warm forging has the potential advantages of (i) reduced tooling loads, (ii) reduced press loads, (iii) increased metal ductility, (iv) elimination of need to anneal prior to forging, and (v) favourable as-forged properties which can eliminate heat treatment. Advantages of warm forging are (i) high production rates, (ii) good dimensional tolerances and surface finish for the forged parts, (iii) significant savings in material and machining, (iv) favourable grain flow to improve strength, and (v) greater toughness of the forged part. Most forging is done as hot work, at temperatures up to 1250 deg C. Cold forging encompasses many processes such as bending, cold drawing, cold heading, punching, extrusions, thread rolling and more, to yield a diverse range of part shapes. These include various shaft-like components, cup-shaped geometries, hollow parts with stems and shafts, all kinds of upset (headed) and bent configurations, as well as combinations. With cold forging of steel rod, wire, or bar, shaft-like parts with 3-plane bends and headed design features are not uncommon. Typical parts are most cost-effective in the range of 5 kg or less. Symmetrical parts up to 3 kg readily lend themselves to automated processing. Material options range from lower-alloy and carbon steels to 300 and 400 series stainless steels, selected aluminum alloys, brass and bronze. In the process, a chemically lubricated bar slug is forced into a closed die under extreme pressure. The unheated metal thus flows into the desired shape. In case of forward extrusion, steel flows in the direction of the ram force. It is used when the diameter of the bar is to be decreased and the length increased. Backward extrusion, where the metal flows opposite to the ram force, generates hollow parts. In upsetting, the metal flows at right angles to the ram force thus increasing the diameter and reducing the length. During the cold forging process, forging is carried out at or near room temperature of the metal. Carbon and standard alloy steels are most commonly cold forged. Cold forging is generally preferred when the metal is already soft, like aluminum. This process is usually less expensive than hot forging and the end product requires little or no finishing work. Cold forging is also less susceptible to contamination problems, and the final component features a better overall surface finish. Advantages of cold forging include (i) production rates are very high with exceptional die life, (ii) improves mechanical properties, (iii) less friction between die surface and work piece, (iv) lubrication is easy, (v) no oxidation or scaling on the work. Disadvantages of cold forging include (i) there can be residual stress, (ii) heavier and more powerful forging equipment is needed, (iii) stronger tooling is required, and (iv) tool design and manufacturing are critical. Often chosen for integral design features such as built-in flanges and bosses, cold forgings are frequently used in automotive steering and suspension parts, antilock-braking systems, hardware, defense components, and other applications where high strength, close tolerances and volume production make them an economical choice. Forged components are shaped either by a hammer or press. Forging on the hammer is carried out in a succession of die impressions using repeated blows. The quality of the forging, and the economy and productivity of the hammer process depend upon the tooling and the skill of the operator. In press forging, the work piece is generally hit only once in each die impression and the design of each impression become more important while operator skill is less critical. The most common type of forging equipment is the hammer and anvil. The hammer is the least expensive and most versatile type of equipment for generating load and energy to carry out a forging process. This technology is characterized by multiple impact blows between contoured dies. Hammers are primarily used for hot forging. In press forging, the metal is shaped not by means of a series of blows as in hammer forging, but by means of a single continuous squeezing action. The open die forging is the type of forging process in which the flat dies with no precut profile in the dies are used. The dies are of simple shape and are used to allow the material to freely deform in lateral directions of the applied load. Movement of the work piece is the key to this method. Larger work pieces weighing over 100 tons and around 25 m in length can be hammered or pressed into shape this way. Open die forging is suitable for only simple shapes because the process gives lesser dimensional accuracy. There is need for high skill of the operators. The dies of open die forgings are simple and less expensive. The process of forging is simplest when compared with other forging processes. Open-die forging is called open-die since the metal is not confined laterally by impression dies during forging. This process progressively works the starting stock into the desired shape, most generally between flat faced dies. In practice, open die forging comprises many process variations, permitting an extremely broad range of shapes and sizes to be produced. In fact, when design criteria dictate optimum structural integrity for a huge metal component, the sheer size capability of open die forging makes it the clear process choice over non forging alternatives. At the high end of the size range, open die forgings are limited only by the size of the starting material, namely, the largest ingot that can be cast. Practically all forgeable ferrous and non-ferrous materials can be open die forged, including some exotic materials like age-hardening super alloys and corrosion-resistant refractory alloys. Open-die shape capability is indeed wide in latitude. In addition to round, square, rectangular, hexagonal bars and other basic shapes, open-die processes can produce the following. Step solid shafts (spindles or rotors) whose diameter increases or decreases (steps down) at multiple locations along the longitudinal axis. Hollow parts which are cylindrical in shape and generally with length much higher than the diameter of the part. It is possible to change length, wall thickness, ID (internal diameter) and OD (outer diameter) as per need. Parts similar to rings can resemble washers or approach hollow cylinders in shape, depending on the ratio of height to wall thickness. Contour-formed metal shells like pressure vessels, which may incorporate extruded nozzles and other design features. Not unlike successive forging operations in a sequence of dies, multiple open-die forging operations can be combined to produce the required shape. At the same time, these forging methods can be tailored to attain the proper amount of total deformation and optimum grain-flow structure, thereby maximizing property enhancement and ultimate performance for a particular application. Forging an integral gear blank and hub, for example, may entail multiple drawing or solid forging operations, then upsetting. Similarly, blanks for rings may be prepared by upsetting an ingot, then piercing the center, prior to forging the ring. Closed die forging is also called impression die forging. The forging process consists of pounding or pressing metal between two dies (called tooling) which contain a precut profile of the desired part. In closed die forging, the material is fully constrained in the cavity created by the upper and lower die halves. Parts weighing a few grams to over 25 tons can be made using this process. Some of the smaller parts can also be forged cold. Closed-die forging of steel, aluminum, titanium and other alloys can produce an almost limitless variety of 3-D shapes. These forgings are routinely produced on hydraulic presses, mechanical presses and hammers. As the name implies, two or more dies containing impressions of the part shape are brought together as forging material undergoes plastic deformation. Since metal flow is restricted by the die contours, this process can yield more complex shapes and closer tolerances than open die forging processes. Closed die forging allows more accurately shaped parts to be formed. The process requires higher interface pressures, very accurate control of material volume and proper die design. Closed die forging is a form of impression-die forging, which does not depend on flash formation to achieve complete filling of the die. Material is deformed in a cavity which allows little or no escape of excess material, thus placing greater demands on die design. Additional flexibility in forming both the symmetrical and non- symmetrical shapes comes from various preforming operations (sometimes bending) prior to forging in finisher dies. Part geometries range from some of the easiest to forge simple spherical shapes, block-like rectangular solids, and disc-like configurations to the most intricate components with thin and long sections which incorporate thin webs and relatively high vertical projections like ribs and bosses. Although many parts are normally symmetrical, others incorporate all sorts of design elements (flanges, protrusions, holes, cavities, pockets, etc.) which combine to make the forging very non-symmetrical. In addition, parts can be bent or curved in one or several planes, whether they are basically longitudinal, equi-dimensional or flat. In closed die forging, work piece is first rough forged close to final shape by blocking die. The work piece is then forged to final shape and dimensions by finishing die. Both blocking die and finishing die are machined into the same die block. More number of dies is needed depending on the complexity of the job. Two die halves close-in and work is deformed under high pressure. Closed die forging provides high dimensional accuracy/close control on tolerances and are suitable for complex shapes. Dies are complex and more expensive and large production rates are necessary to justify high costs. Die design depends on the knowledge of strength and ductility of work piece material, sensitivity of material to the rate of deformation and temperature, frictional characteristics, shape and complexity of work piece, and die distortion under high forging loads. Die material requires strength and toughness at high temperature, hardenability and ability to harden uniformly, resistance to mechanical and thermal shocks, and wear resistance to resist abrasion wear due to scales present on work piece. Selection of proper die material depends on the die size, composition and properties of work piece, complexity of shape, number of performing steps, forging temperature, type of forging operation, cost of die material, number of forgings needed, and heat transfer from work piece to dies etc. Normal die materials are tool and die steels. Most of the engineering metals and alloys can be forged via conventional closed die forging process. These include carbon and alloy steels, tool steels, and stainless, aluminum and copper alloys, and certain titanium alloys. Strain-rate and temperature-sensitive materials (magnesium, highly alloyed nickel-based super alloys, refractory alloys and some titanium alloys) can need more sophisticated forging processes and/or special equipment for forging in impression dies. Seamless rolled ring forging is typically performed by punching a hole in a thick, round piece of metal (creating a donut shape), and then rolling and squeezing (or in some cases, pounding) the donut into a thin ring. Ring diameters can be anywhere from a few centimeters to around 10 meters. Rings forged by the seamless ring rolling process can weigh from less than 1 kg to up to 150 tons. Performance-wise, there is no equal for forged, circular cross-section rings used in energy generation, mining, aerospace, off-highway equipment and other critical applications. Seamless ring configurations can be flat (like a washer), or feature higher vertical walls (around a hollow cylindrical section). Heights of rolled rings range from a few centimeters to more than 3 meters. Depending on the equipment used, wall-thickness to height ratios of rings typically range from 1:16 up to 16:1, although greater proportions have been achieved with special processing. In fact, seamless tubes up to 1200 mm in diameter and over 6 meter long are extruded on forging presses. Even though basic shapes with rectangular cross-sections are the norm, rings featuring complex, functional cross- sections can be forged to meet virtually any design requirements. Aptly named, these contoured rolled rings can be produced in thousands of different shapes with contours on the inside and/or outside diameters. A key advantage of contoured rings is a significant reduction in machining operations. Not surprisingly, custom contoured rings can result in cost saving part consolidations. Compared to flat face seamless rolled rings, maximum dimensions (face height and OD) of contoured rolled rings are somewhat lower, but are still very impressive in size. Various forging operations are drawing, swaging, upsetting, fullering, forged welding, flatting and setting down, edging, bending, cutting and punching. Drawing – Drawing operation is performed to elongate the work piece and to decrease the cross sectional area. Drawing operation takes place when the forces act towards the perpendicular direction of the longitudinal axis. Swaging – Swaging is carried out by cold forging process. This operation is used for changing the dimensions of the work piece and is done by using the dies force which is applied on the material. Upsetting – Upsetting is performed to increase the cross sectional area of the work piece. For getting the required result, the upsetting operation is performed along parallel direction of the longitudinal axis. The upsetting operation is usually carried out in the production of nuts and bolts. Fullering – It is a typical open die forging process. Fullering is mostly used as an earlier step to help distribute the material of the work in preparation for further metal forging operations. This often occurs when a manufacturing process requires several forging operations to complete. In fullering, open die with convex surfaces are used to deform the work piece. The result is to cause metal to flow out of one area and to both sides. Forged welding – This is the operation to increase the length by joining two metal pieces. This is carried out by applying the hammer blow or pressure when the work pieces reach the forging temperature. Flatting and setting down – Fullering leaves a corrugated surface on the work piece. Even after a job is forged into shape with a hammer the marks of the hammer remains on the upper surface of the job. For removing the hammer and corrugation marks and for obtaining a smooth surface on the job, a flatter or set of hammer is used. This process is known as flatting or setting down. Edging – During the process work piece material is placed between the two dies and there is striking at the edge of the material to obtain a required shape. Edging is often a primary drop forging operation. Bending – It is a very common forging operation. It is an operation to give a turn to metal rod and plate. This operation is needed where forged parts have bend shapes. Cutting – With the help of hammers and chisel, it is possible to cut rods and plates into two pieces. This forging operation is carried out when the rod is in hot condition. Punching – It is the forging operation by which holes are made with the help of the hollow cylinder. When we are applying the pressure on the cylindrical die holes then it moves downwards to make a hole on the plate. The continuous development of forging technology requires a sound and fundamental understanding of equipment capabilities and characteristics. The equipment used in forging influences the forging process since it affects the deformation rate and temperature conditions and determines the rate of production. The requirements of a given forging process are also to be compatible with the load, energy, time, and accuracy characteristics of a given forging machine. The most common type of forging equipment is the hammer and anvil. The choice of forging equipment depends on a number of factors, including part size and complexity, material, and the quality of the parts to be produced. Hammers are often preferred for small to medium batches because of quicker tool. This forging equipment can be divided into two basic types namely (i) work restricted machines, and (ii) stroke restricted machines. In work-restricted machines the amount of deformation which can be achieved during each stroke or blow of the machine is limited by the energy or maximum force available. If the energy or force capacity is less than what is needed to deform the part, then more than one stroke or blow is required. Machines which fall into this category are hammers, friction screw presses, and hydraulic presses. Hammers are the most common types of machine used. They are often preferred for small to medium batches because of quicker tool setups and lower overheads. They are also used for elongated and branch-type forgings because die areas can be provided for the larger number of preform dies required for such shapes. The various types of hammers used are as given below. Gravity drop hammers – They are the oldest type of forging equipment available. The principle of operation is that the moving die block is raised by a lifting mechanism and then released, so that it falls onto the fixed die attached to the anvil. The amount of deformation which can be carried out is determined by the potential energy of the moving die block at its maximum height. This potential energy is converted into kinetic energy as the die block falls and is then dissipated in deformation of the work piece. Various lifting mechanisms are used, including frictional means with boards, band brakes or belts, or a lifting cylinder employing steam, compressed air, or hydraulic fluid. These machines are available in a range of blow energies from 0.6 kNm to 400 kNm. Double acting or power hammers – These machines are similar to gravity hammers in that a lifting cylinder raises the moving tup, but power is also applied to the downward-moving tup to increase the energy capacity. Energy ratings for similar tup weights are considerably more than for gravity hammers, and the die closing speeds are higher also. Power comes from double-acting steam, compressed air, or hydraulic cylinders. Double-acting hammers are manufactured in a range of energy ratings from 3 kNm to 830 kNm. Vertical counter blow hammer – In these machines, two tups with nearly equal masses are driven by double-acting cylinders toward each other and impact in the centre of the machine. More energy is dissipated in the work piece than in the foundations and subsoil compared to single-acting hammers. Very high energy capacities are available in these machines which range from 30 kNm to 2000 kNm. Horizontal counterblow hammer – These machines are also called impacters and two rams are actuated by double acting cylinders. Heated stock is positioned vertically between the dies by an automatic transfer mechanism. Typical energy rating ranges from 4 kNm to 55 kNm. In screw presses, the upper ram and die are connected to a large vertical screw which can be rotated by a flywheel, so that the ram can move up and down relative to the fixed die in the bed of the machine. The ram has a limited amount of energy for each stroke, thus multiple blows are usually employed similar to hammers. Screw presses are available in ratings from 63 tons -6300 tons. Hydraulic presses are available in a wide range of sizes up to the largest at 50,000 tons or more capacity. The moving die is attached to a ram actuated by a large hydraulic cylinder. Various strokes, forces, and closing speeds can be obtained on hydraulic presses. In some cases hydraulic presses are fitted with auxiliary horizontally moving rams, and these enable side depressions to be forged into some parts, although this is not done to a great extent. In stroke-restricted machines the amount of deformation which can be done is fixed by the stroke of the machine. If sufficient force or energy to carry out the operation is not available, then the machine stalls and a larger machine is to be used. Mechanical presses fall into this category, as a crank or eccentric determines the amount of ram movement. Mechanical presses belong to a class of machine tools that encompass a wide range of different machine types. Primarily, the mechanical press transforms the rotational force of a motor into a translational force vector that performs the pressing action. Hence, the energy in a mechanical press comes from the motor. These types of presses are generally faster than hydraulic or screw presses, (actually the screw press can also be classified as a mechanical press). Unlike some presses, in a mechanical press, the application of force varies in both speed and magnitude throughout the distance of the stroke. When performing a manufacturing operation using a mechanical press, the correct range of the stroke is essential. In mechanical presses, a crank, knuckle joint, scotch yoke, or moving-wedge mechanism is used to apply a vertical squeezing motion between the upper moving die and a lower fixed die. During the process of forging there is possibility of occurrence of some defects. In hot forging process, the common defects are hot shortness, shear bands, grain boundary cavitation. In the cold forging process, the common defects are surface cracks, shear band and centre burst. 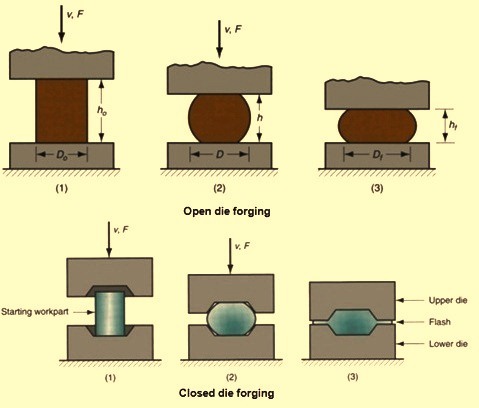 The common defects during forging operation are namely (i) incomplete die filling, (ii) die misalignment, (iii) forging laps, (iv) incomplete forging penetration, (v) microstructural differences resulting in pronounced property variation, (vi) hot shortness, due to high sulphur concentration in steel and nickel, (vii) pitted surface since oxide scales occurring at high temperature stick on the dies, (viii) buckling, in upsetting forging, due to high compressive stress, (ix) surface cracking, due to temperature differential between surface and centre, or excessive working of the surface at too low temperature, and (x) micro cracking due to residual stress. Also defects like (i) cold shut, (ii) die shift, (iii) improper grain flow, (iv) flakes, (v) scale pits, and (vi) cracking at the flash can occur. Cold shut is due to incomplete welding process. The two surfaces of the work pieces material are touching each other. The main cause for the cold shut is excessive chilling, sharp corners and high friction. To avoid the cold shut radius of the fillet is increased on the die. Die shift is due to the misalignment of the dies halves. To improve the shapes, the dies are made in two halves. To avoid the die shift, it is necessary to align the die halves properly and provide half notches on the upper and lower side of the die. So during the alignment, if the notch is matched on both the sides then proper shapes can be achieved. In case of unfilled section defect, the moving metal does not fill the die chamber completely. It can be due to the improper design of the forging die, poor heating and lesser amount of the raw material. Scale pits are due to the irregular cleaning on the exterior surface of forging. The scales and oxide are get rooted in to the finished surface. The defect of improper grain flow is due to improper design of the die because of which the flowing material does not flow downwards. To avoid the improper grain flow, proper design of die is important. Flakes are the internal disagreements which are basically found in the arrangement. They are mainly cause because of improper cooling. To avoid the flakes defect, proper cooling procedures are to be followed. Residual stresses are due to the improper cooling and non-uniform deformation of the forging. To avoid this defect during a period of time slow cooling in a furnace or under ash the forging is done. Surface cracking is due to low temperatures and excessive work. To avoid the surface cracking, suitable temperatures are used for the forging process. Incomplete forging is mainly due to the forging taking place at the surfaces which causes no break-up of the interior of the forging. To avoid, it is preferable to use light hammer blowers for the process. Cracking at the flash is due to the incomplete thickness of the flash. Hence to avoid the cracking at the flash, it is necessary to increase the thickness of the flash.